*UPDATED SEPTEMBER 6, 2018: Umitron added a further S$3.7m ($2.7m) of funding from SPARX Capital’s Mirai Creation Fund. Umitron, an Asian startup using satellite imagery, IoT, and automation to increase the efficiency of offshore aquaculture, has raised S$15.2 million ($11 million) in seed funding. Umitron helps aquaculture farmers give their fish the right amount of feed at the right time by tracking their behavior, lowering farmers’ biggest cost base in the hope of bolstering the sustainable production of fish worldwide. The Japanese government-backed Innovation Network Corporation of Japan invested alongside D4V (Design for Ventures), a Japanese venture capital fund founded by Tom Kelley, a partner of design thinking innovation consultancy IDEO in San Francisco and author of many books on innovation. SPARX Capital’s Mirai Creation Fund, which countsToyota Motor Corporation and Sumitomo Mitsui Banking Corporation as investors, joined the round a few months after its first close in June 2018. Angel investors also contributed. Umitron is headquartered in Singapore but run by a Japanese team including ex-employees of The Japan Aerospace Exploration Agency (JAXA), Japan’s version of NASA. The startup also has clients in Japan as well as Singapore. 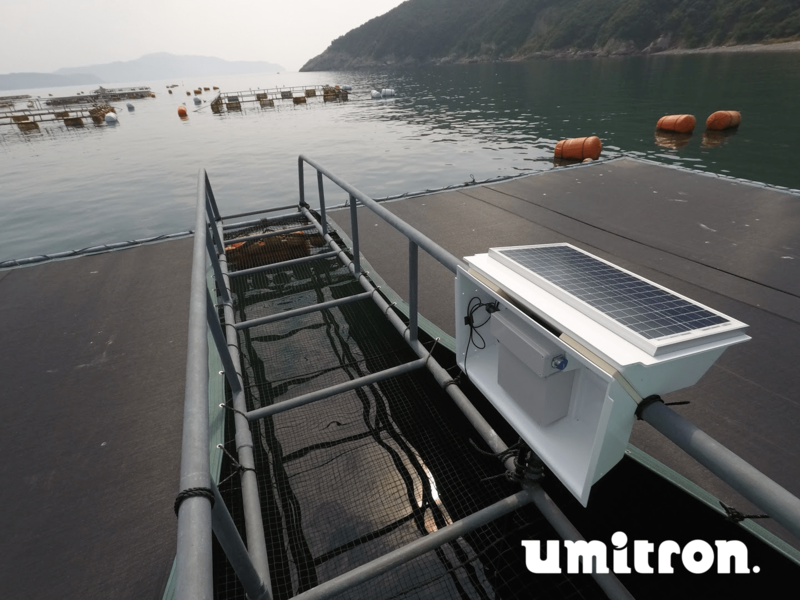 Umitron’s technology stack includes a solar-powered IoT device — the UmiGarden — that is deployed on aquaculture farms in the ocean to film fish and measure patterns in their behavior using computer vision. Through machine learning algorithms Umitron can detect when fish are hungry, and automatically release feed for the fish. This prevents farmers from overfeeding to help them reduce their biggest cost, and can all be managed remotely. Satellite imagery augments these insights by providing information about the temperature of the sea, which also impacts how fish eat — if the water temperature is higher, fish prefer to eat differently. “You can compare it to how you like to eat ice-cream on a hot day,” said Yamada. Umitron also uses satellite imagery to detect the amount of available plankton in the oceans, he added. Since offshore aquaculture farms are often miles from the shore with limited connectivity, Umitron’s devices process the data using edge computing, and compress them on-site to enable the transfer of data back to the shore with limited bandwidth. The startup also determines how much power it will be able to collect from solar energy based on weather forecasts. “These capabilities make us stand out from comparable aquaculture IoT companies for land-based fish farms,” said Yamada. Farmers are also using the data Umitron collect to analyze the behaviors of different species to determine the best way to farm new species such as a new hybrid between salmon and bonito. Umitron’s clients currently farm tuna, sea bream, eel and salmon as well. The startup is also in discussion with alternative aquaculture feed companies such as insect-based fish feed — to analyze the performance of their product compared to typical fishmeal.